The Adjustment Bureau reviewed by me for some reason. Posted on March 30, 2011 by D.J. Why a review of The Adjustment Bureau when it’s been out for almost a month now? Because I just saw it and a smart person suggested I do a review of it when I was complaining I didn’t write enough, that’s why. As to why I saw it so late, well, I get these free movie passes from donating blood platelets, and they only get me into movies that have been out a while. It was between this and Rango, which I also would like to see, but The Adjustment Bureau‘s show time was more convenient for me. So, with that kinda need to see and passion, I was in for a superlative movie-going time. But first I had to get popcorn. This is where they get me, because, yeah, the movie is free, but now I’m spending money on popping corn, and, oh, gotta get soda to wash that down. Now we’re at $9.50 for a movie I only kinda want to see, and only then if it’s free. Oh well. I like popcorn. Look, so, this is a review, right? There are going to be some spoilers. Nothing major, but if you don’t want anything about a month-old movie ruined for you, stop reading. You have been warned. Anyway, Damon is this smooth talking, earnest, genuinely decent though sometimes rough around the edges fella with a tragic past who wants to be a senator. Blunt is a pretty dancer lady. They meet cute after Damon loses an election, and her playfulness and love of life or whatever rubs off on him, inspiring him to give a candid concession speech that makes him more popular than ever and a shoo-in for the next election. That’s the last they’re supposed to see of each other. Then chance or whatever sets in, and they meet again. And again. The Adjustment Bureau, who might be kinda angels (and their unseen boss, “The Chairman,” might as well be God), don’t want these two crazy kids to get together because it’s not part of the mysterious plan, which is cooly represented in their journals as some kinda animated maze-lick schematic or something. So, basically, this becomes a sci fi romance of “will they or won’t they”? shenanigans versus fate or God or whatever. There are some great themes, nice performances, and a good visual style. Unfortunately, the film’s score and soundtrack seemed… inappropriate to me. The score, by Thomas Newton, had a vaguely 80s action movie or drama feel. I barely remember it now, but at the time it did get in the way of my viewing pleasure. And then, at the end, during this go for broke chase scene involving cool Adjustment Bureau-y secret modes of travel and hats and running, they have a remix of the song “Fever,” which was just… weird. To me, anyway. Maybe it’s a bold choice that I just don’t get. Aside from this weird soundtrack hang up I have, the movie is pretty fun. Questions of free will versus fate are always intriguing to me, and they’re presented well here. There’s some real tension and interesting twists. Damon and Blunt’s relationship is mostly believable, though Blunt’s character sometimes falls into the manic pixie dream girl trap. She’s very poised and smart, but at one point she drops Damon’s phone in a cup of coffee, and then later she “cutely” punches him in the stomach to win a playful race. Ladies, please don’t get ideas here. No matter how cute you are, most fellas will get justifiably pissed if you ruin their phones or gut check them. The Adjustment Bureau folks themselves are all snazzy dressers who work out of a very nice office built with fine mahogany. They’re very similar to The Watchers on Fringe, but with hair and more personality, so they’re cool in different ways. Proceedings get kinda corny at various points right up to the end when it, but, all in all, it’s worth a viewing. 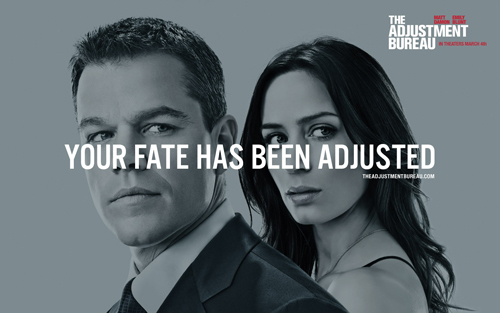 This has been D.J.’s just writing for the sake of writing something review of… The Adjustment Bureau! Posted on March 3, 2011 by D.J. 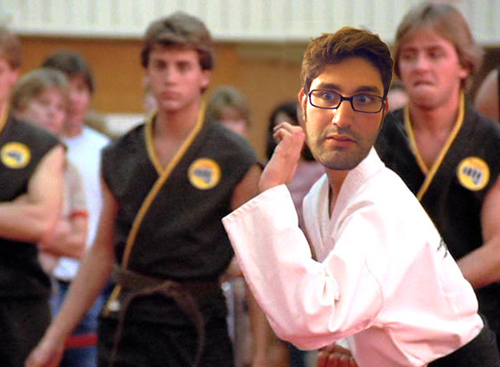 I like to sometimes pretend I know karate. No, I don’t go doing karate moves or breaking bricks with a chop of my hand or kicking things. I just like to tell people I know karate. When that type of thinking, true as it may be, fills my brain, I decide I’d like to pretend I’m learning karate. It’s a subtle difference, but it’s a smaller kind of lie or, if I don’t blatantly say it aloud, gentle self-delusion. Fooling myself into thinking I’m the kind of guy who is taking it upon himself to learn the ancient and understandably feared art of karate helps me walk a little taller. At 6’3″ walking taller might seem a bit excessive, but it helps my posture. And I look like a goon when I slouch, which is unfortunately often. Yes, like millions (thousands?) of people on this earth, I could actually learn karate. The only thing stopping me from doing so is my own laziness. But that laziness makes me who I am. And who I am is a big lazy guy who thinks it’d be cool to know karate even if I’m too lazy to actually study karate and… try. The ending doesn’t read as positive as I’d hoped.